With 75 percent of the nation’s hops grown in Yakima, this year's harvest is one of the most anticipated by brewers around the world. In 1868, Charles Carpenter, a farmer’s son from New York state, moved to the Yakima Valley, where he started his own farm near the town of Ahtanum, just south of present-day Yakima, and planted his first hop fields. He soon recognized that this place was particularly well suited for growing hops, with its average of more than 200 days of sunshine per year and fertile soil deposited by a meandering river that also provides water for irrigation. But it’s unlikely he imagined that 149 years later it would be one of the most productive hop-growing areas on earth. A lot has changed since Carpenter started his farm with little more than an ox cart and some rootstock from his father’s hop farm, but six generations later, one thing endures: The Carpenter family still owns the farm and still grows hops. It’s one of several multigenerational families that run hop farms in the Yakima Valley. In 2015 and 2016, the Yakima Valley produced more hops than any other agricultural area in the world, edging out Germany, which held that title for ages. Each year, about 75 percent of the nation’s hop crop comes from the Yakima Valley. Although the public may not know it, Yakima is recognized by beer brewers around the world as America’s hop mecca. Photograph by John Vicory. A bottom cutter—resembling a tractor—chops off the hop bines at ground level, the first step in the harvest. It will be followed by a top cutter. Along with the quantity of hops they produce, Yakima farmers have also gained a reputation for developing new, interesting and more flavorful hop varieties—a practice referred to as hop breeding. A visit to Yakima allows a brewer to keep in touch with the latest creations and find out what might be on the horizon. For brewers, there’s something deeply satisfying about wandering through the hop fields just before they’re harvested, when the plants are fat with cone-shaped hop flowers and climb 20-foot trellises that are lined up in long rows that stretch on as far as the eye can see. “I remember going to big picnics when I was a kid and meeting the merchants, the brewers and other [hop-farming] families. There were hundreds of people there,” says McGree. The act of harvesting hops is a bittersweet, well-orchestrated process that involves bringing down the plants, picking the precious cones and then drying the hops in huge kilns—activities that were once performed by human hands but are now managed by sophisticated machinery. Touring the fields, watching the harvest, talking to farmers and ultimately deciding which hops they want is an activity breweries refer to as hop selection, and its impact on the local economy is relatively new. Thirty years ago, the brewing industry was composed of a handful of super-size breweries, but today, the United States is home to more than 5,300 breweries, about 350 of which are in Washington. Compared to the relatively bland beers produced by those old-school mega breweries with names you recognize from television commercials, today’s smaller, craft breweries create beers that rely more heavily on hops for flavor. Photographs by John Vicory. The picking machine separates individual hop cones from the bines; Joe Morrier, Jr., of Morrier Ranch inspects the hops during the kiln-drying process, a critical step in preserving the aroma, flavor and character of the hops. 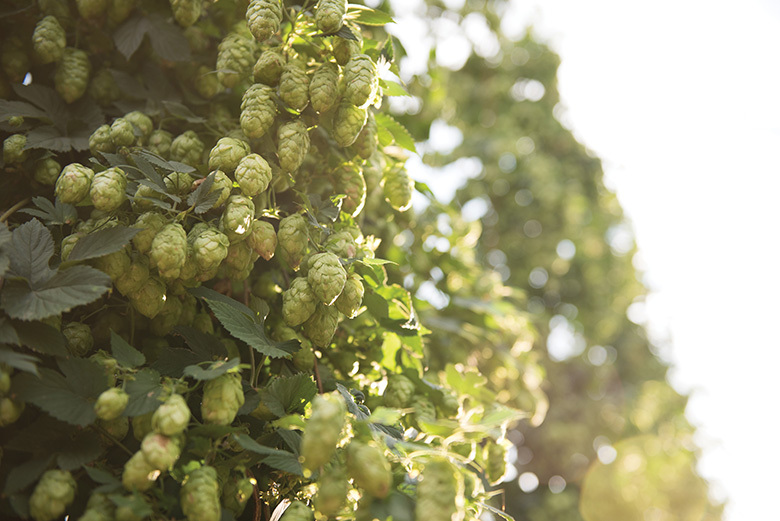 Today, brewers can choose from more than 130 varieties of hops, many of which are grown in the Yakima Valley. Like wine grapes, each hop variety has its own character and adds floral, fruity, bitter or earthy notes to the beer. Pale ale and India pale ale are just two examples of popular craft beer styles that rely heavily on hops for their basic character. Most often, beer recipes use a combination of hop varieties, which means hops offer brewers the ability to create unique flavor profiles. Most of these varieties were developed over the past 30 years to satiate the craft beer industry’s voracious appetite for new and more flavorful hops. In washington state, hop farms are largely family farms. Families that include the Carpenters, Morriers, Gamaches, Perraults, Brulottes, Gasselings, Smiths and others have been growing hops in the Yakima Valley for several generations. Wonderful, but not easy or stress-free. Each spring, thousands of hop rhizomes, which lie dormant in winter, begin producing plants that are trained by hand to climb 20-foot trellises, an act that involves encouraging the plant’s bines (similar to vines) to wrap around the guidewires that lead up the trellis. Photograph by John Vicory. Elizabeth McGree of Morrier Ranch stands among the bines on her family’s Yakima ranch. And with hops—as with most crops—farmers are reliant on weather for a good harvest: enough sun to draw the hop plant upward and enough precipitation, snow and rain, to fill reservoirs in the nearby mountains for irrigation throughout the growing season. Also, as with other modern crops, an increasing number of farmers are now growing USDA-certified organic hops, a recent development in the industry, to meet the increasing demand from the brewing industry. Although new varieties are developed to resist disease, the hop plant is particularly vulnerable to downy mildew, a fungus-caused disease that can decimate a crop. In the end, like any farming endeavor, it’s something of a gamble each and every year. Still, after 15 years away from Yakima and the Morrier family’s businesses—the family also owns two hotels in Yakima, the Hilton Garden Inn and the Hotel Maison, a boutique hotel where the walls are adorned with artistic photos of the family’s farm—McGree found herself drawn back to Yakima. “I just can’t think of a better place to be than the Yakima Valley,” she says. In addition to her role on the family farm, she also serves on the Washington Hop Commission, a state commodity commission that represents hop growers. Photograph by John Vicory. At Bale Breaker Brewing, a taproom and brewery located in a hop field near Yakima, a worker adds hops to the boil, part of the beer-brewing process. Photograph by John Vicory. The loud, fast hop-picking machine, with multiple moving parts, employs several methods to get the cones—which are used for brewing— separated from the rest of the plant. When you hear the term “fresh hop” associated with a beer, it indicates that the beer was made using hops that were harvested less than 24 hours before the beer was brewed. These beers can only be brewed during harvest season, which is August and September. While breweries in other regions of the country must rely on FedEx and UPS to deliver their fresh hops in less than 24 hours, brewers in the Pacific Northwest enjoy the advantage of being able to drive to the farm, pick up the hops and get them in the brew kettle within a matter of hours. The Kent Valley, south of Seattle, hasn’t always had that name and hasn’t always been an industrial hub. It was once a prolific agricultural area where, for a short time during the 1880s, hops were one of the most bountiful crops. In fact, the city of Kent was named after the county of Kent, the major hop-producing region in England. In 1889, when an aphid infestation in Europe created a worldwide shortage of hops, Kent, Washington, became a major supplier, shipping hops to breweries around the globe. Sadly, in 1891, our Kent suffered an aphid infestation of its own, and the local hop industry never recovered. Several of the oldest hop-farming families in the Yakima Valley are of common descent. The 1890s saw several French-Canadian families immigrate to Moxee, a town just southeast of present-day Yakima, because of land deals being offered by the Moxee Company, a 7,000-acre farm that was disbanding. Many of these newcomers came by way of Minnesota and northern Michigan, while others came directly from Canada. Why the Moxee Company chose to promote the land deals in those areas is not known.